Preface: Chris Campbell from Adobe asked me to collect some feedback concerning AIR from the Starling community. Which direction should the team take in 2016? What should be their priorities? And since it's Christmas time, I thought I'd wrap this little questionnaire up in a Christmas story. (1) On Christmas Eve, Santa Clause takes you aside. "Ho-ho-ho", he says, "my elves report to me that you've been a very nice and busy developer this year. So I will grant you one free wish!" When you look closer, you see that this Santa is actually Chris Campbell in disguise (not Kris Kringle), so you resist the urge to tell him about this hoverboard you always dreamed of; instead, you tell him about this one feature that you always desired to have in Adobe AIR, but were too afraid to ask for. (2) When you speak this out loudly, you notice that Santa becomes a little uncomfortable in his red coat. Maybe it's just that his (fake?) beard is a little itchy, but what if you asked for too much? "Ehm, scrap that", you say, and quickly think of something smaller. "There's this one little thing that always annoyed me. Could you please ...?" (3) Santa takes out his phablet and notes this down. (It takes a while, because his gloves don't seem to work properly on that device.) After a while, he finishes and turns back to you. "I will see what I can do about that", he promises, and you're suddenly looking *SO* forward to AIR 21. You already expect him to fly off, but then he turns back. 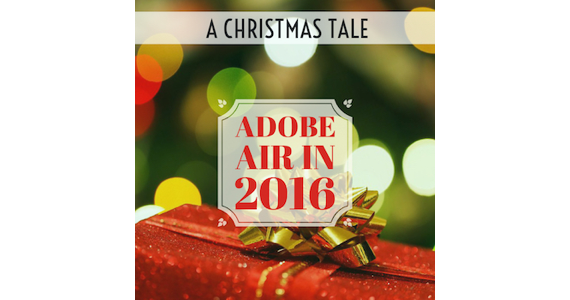 "I'm aware that you are extremely loyal to AIR", Santa continues in a more business-like voice. "But everyone has naughty, secret dreams now and then, so ... if you ever imagined switching to another framework: what does it have that AIR is lacking?" (4) Phew, you're happy that this is out of the way! Santa seems to be such a nice man, you hate to confront him with his shortcomings. After talking so blunt, you feel you have to cheer him up a little, so you continue: "You've got a really great platform with AIR, you know? You just need to leverage your strengths better! You're doing some things really well and should expand on those, more specifically ..."
Santa seems to be very happy with what you just suggested. "Well, this was an extremely productive Christmas Eve", he says, and you think that's an odd thing to hear from his mouth. "Thank you very much!" Before you can properly say goodbye, he quickly steps back into the chimney he came from, leaving only a magically shimmering particle system behind. Now that you know that Santa Clause is actually real ... this reminds you of another miracle you were always waiting for. Feeling the sweat on your hands, you take out your iPhone and try to load the Flash Plugin. Damn, it still doesn't load. "Now don't be ridiculous", you say to yourself and leave the room to rejoin the other students at the Hogwarts Christmas ceremony. Thanks a lot in advance for your feedback! If you answer a specific question, add the number you're referring to. But you can also just write whatever is on your mind. Any feedback is appreciated! Support at least for 3 years. Everything you do is great, you and your team are my heroes!!! Just keep it up! New features to AS3 and execution speed improvements. SoftkeyboardBehavior "none" has no effect. SoftkeyboardRect "height" property is Incorrect. SoftkeyboardBehavior with GPU mode is unusable. True full screen android support. We would love to see more export platforms support. Mostly Win10 mobile. We would also love to see true "promotion" of Adobe AIR, because we want more job offerings in our beloved technology. 3 - a simple built-in physics engine that enables simple physics interactions(it also can be part of StarlingFW! instead of Air itself). I almost forgot. It would be spectacular, if Adobe had improved WebView inside runtime, not ANE with same robust API on all supported platforms. This is even more important, because we should show how Flash is DEAD to the public, after all these years. Bugfixes. Fix all bugs with > 5 votes in the bugbase. Stuff like AIR not working on Android 6.x or the Inline metadata tag being totally buggy. The compiler is an idiot by today's standards. Writing things like ++i or i++ matter. Dictionary access is like 10x slower than things like accessing by reference. 3) Please, more improvements to AS3!